The phrase "Mommy Needs Coffee" is one that Winchell Mountain Coffee, an artisanal, family-owned coffee roaster based in New York State’s Catskill region, takes VERY seriously. However, just because owners Will Rivkin and Allen Ricca take the art of coffee seriously, they didn't think their coffee needed to look so, well, SERIOUS! Proving that their coffee LOOKS as good as it tastes, Winchell Mountain Coffee is pleased to introduce their exclusive Sandra Boynton Coffee Collection -- witty, playful and smile-inducing on the outside, caffeine-fueled bliss on the inside. 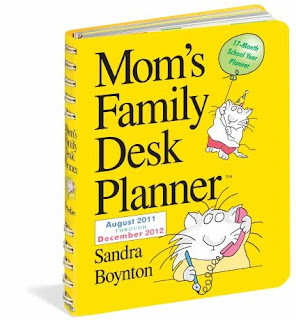 A beloved cartoonist and children's book author for well over 40 years, Sandra Boynton's wry humor and legendary characters are perfectly matched with 15 varieties of hand roasted coffees with names like "Expresso Overdrive," "Not a Morning Person," and "Bob's Diner." To celebrate cupid's favorite holiday, Winchell Mountain Coffee is sharing some caffeinated love with a limited edition Viennese roast "Valentine's Day: An Affectionate Blend." 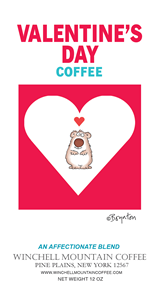 A great gift idea for the coffee fanatic, "Valentine's Day" and the entire Sandra Boynton Collection is available in markets and cafes across the country and online at www.winchellmountaincoffee.com. * They use beans from all around the world and will not accept a shipment until that harvest has been sampled repeatedly, both in its raw green form and in its roasted form. * With these carefully selected beans, they create exclusive blends like the more rare single origin coffees called yrgacheffe. Yrgacheffe is a region of Ethiopia and rumored to be where the first coffee bean came from. * They are obsessed with quality and will throw entire roasts away if the beans are not sampled perfectly. * One-way goglio valve bags vacuum pack the beans so consumers are guaranteed the absolute freshness. Using this technology there is no air whatsoever entering the beans to spoil their integrity so the bags have a healthy shelf life of up to six months. 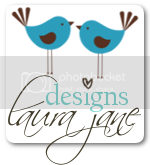 Although in the past years I gave jewelry, chocolates, candy, candles to friends, family members and teachers for Valentine's day, I have never considered giving coffee and coffee mugs as gifts for this fun holiday before. Now that I have tried some of Winchell Mountain Coffee, I am definitely considering picking up some more of these coffee as gifts for DD's teachers at school as well as some for my in law's. The coffee are packaged very well (with cute Valentine's Day theme colors and images) and I thought they tasted really great as too. I know that I would have loved gotten their coffee as gifts for myself, so I would not hesitate to give them as gifts also. If you are in the market for some coffee, be sure to check out Winchell Mountain Coffee. 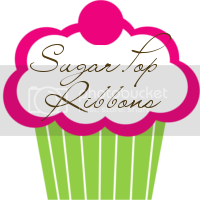 Winchell Mountain Coffee is pleased to offer Sugar Pop Ribbons a Valentine's Day giveaway my followers will LOVE (pun intended:)) -- a bag of the limited edition "Valentine's Day: An Affectionate Blend" -- beans or ground, winner's choice! 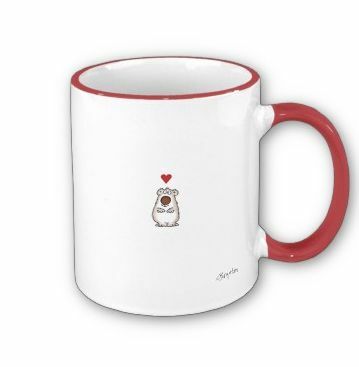 (http://www.winchellmountaincoffee.com/node/72), a Sandra Boynton coffee mug (http://www.zazzle.com/fuzzy_little_heart_by_boynton_mug-168045126811433218) and Sandra Boynton's 2012 Mom's Desk Planner (http://www.workman.com/products/9780761162704/). This giveaway is open to US residents only and will end on Jan 26th, 2012. I would also like to try their "Not A Morning Person" blend--sounds like something that's right up my alley! I would also like to try their "Not A Morning Person" blend! im a long time gfc follower! i would love to try their birthday blend! The birthday blend sounds awesome! I'd like to try the beach blend. GFC as Shelly Hill. I would like to try their Decaf Danish coffee. I'd love to try the "Organic Mexican Viennese" ! I would like to try the Bob's Diner blend. I have to say, that I love their presentation. Great bags. I would love any variety that gives me a bold cup of coffee - the "not a morning person" sounds interesting . . . . I would love to try the Not A Morning Person. I would like to try the Decaf Organic Mexican Viennese. I would like to try the Organic Fair Trade Peruvian. I would like to try their Decaf. Danish Coffee. I follow and would like to try the decaf danish. I'd like to try Not A Morning Person. Would like to try their Sample Sacks. ravish30 at aol dot com this is my afternoon tweet...thanks! I would get the Beach Blend-I follow you via GFC as dwellenstein. I'd like to try the Country Morning Blend. I'd love to try the All-Nighter Coffee. I would like to try Winchell Mountain Coffee's Country Morning blend coffee. The Allnighter coffee sounds great. I'd like to try Kenya AA because it might be a lighter coffee since it might be compared to tea. I would love to try the Wide Awake Coffee. These coffees are all adorable - if they are as good as they are cute, they are an awesome product! 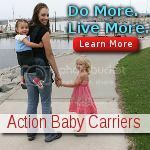 I entered the Diono Car SEat Giveaway too! I would love to try the Not A Morning Person blend. I would like the evening coffee. I would like to try overdrive espresso. I would like to try the Official Gravity Feed Coffee. I'd like to try Beach Blend. I would like to try their Not A Morning Person. Thanks so much for the fantastic giveaway! I am following you via Google Friend Connect! Also added you as a friend on fb...Savanna Ashley Cowen. I'd like to try their Costa Rican coffee. I would like to try the Country Morning Coffee. I love the names of the coffe. I would love to try the Sudden Inspiration. country morning blend sounds great! I would like to try the Beach Blend. I like the Birthday Blend coffee. I would like to try the wide awake.... mostly because the name sounds fun! I would love to try the Up and at ‘em Coffee Blend from Winchell Mountain Coffee. The Beach Blend also sounds good. 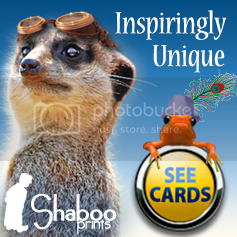 In footer of home page. I would love to try the allnighter coffee. I love the idea of the Sample Sacks. Thanks for the giveaway! I follow via GFC. didn't know if needed to leave two comments for mandatory? I would love to try the mountain blend! I would LOVE to try the "Serious Coffee"! I would love to try A thoughtful blend.